There’s no way around it: smoking is bad for your overall health and oral health. Recently, the popularity of using e-cigarettes, or vaping, has increased dramatically. 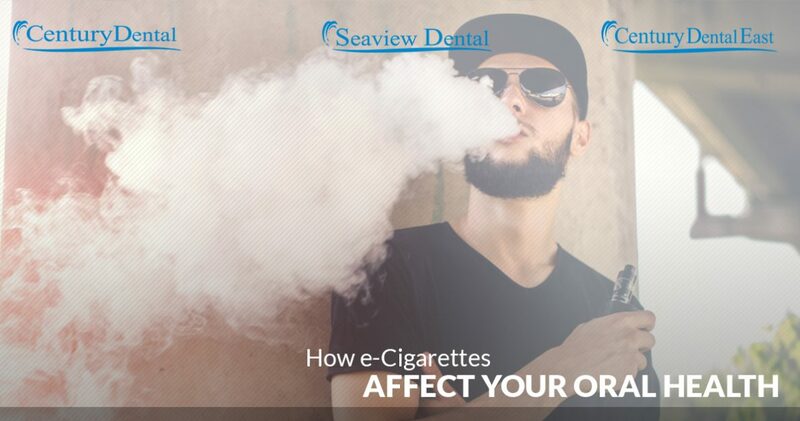 While many e-cigarette manufacturers call vaping a “healthy alternative to smoking,” there are still dangers associated with this habit — especially when it comes to your oral health. Experts have agreed that e-cigs are less dangerous than traditional cigarettes because you are inhaling vapor rather than smoke. But this doesn’t mean that you aren’t inhaling toxins, and because vaping is relatively new and under-regulated, it is not uncommon for e-cig labels to contain false information about ingredients and nicotine levels. Dentists see the negative consequences that smoking can have on your teeth every day. If you smoke, chew tobacco, or vape, you are at risk for gum disease, oral cancer, and other health problems. It is extra important to regularly visit one of our practices for a check-up. This way, we can catch problems early and find the best treatment options. First, we’ll start with the good news. Unlike smoking, vaping does not stain your teeth, cause bad breath, or cause plaque build up. Vaping also does not involve inhaling tobacco smoke, which is full of cancer-causing carcinogens. Smoking is a leading risk factor for gum disease, lung cancer, and oral cancer, which is why your dentist has likely told you to quit smoking. Because vaping is relatively new, there are fewer studies available on vaping and its relation to cancer. However, we do know that vapor in e-cigarettes contains carcinogens, though initial studies show far fewer carcinogens in comparison to cigarette smoke. One such carcinogen that traditional cigarettes and most e-cigarettes have in common is nicotine, which is also the addictive chemical that keeps you coming back for more. Nicotine is known to promote tumor growth that can lead to lung, breast, and pancreatic cancer. Some e-cigs also contain formaldehyde, cadmium, nickel, and lead. One of the most important things that dentists and oral hygienists do is check for signs of oral cancer. This is a part of your regular check-up and should be motivation enough to come in for semi-annual visits. Nicotine is known to reduce blood flow in your mouth which can cause your gums to not receive the oxygenated blood they need to stay healthy. This can make you more susceptible to gum disease as well as prevent mouth sores from healing as efficiently. Nicotine can also cause dry mouth and reduce saliva production which can lead to cavities and decay. Saliva is our body’s natural defense against tooth decay as it helps to wash away sugar and food particles. We encourage our patients to be honest about their smoking habits and tobacco use so we can have a better understanding of their oral health. At your check-up, your dentist and hygienist will thoroughly check for signs of oral cancer, gum disease, and other issues that can cause serious problems if left unnoticed. If it has been more than six months since your last visit, or you have noticed changes in your oral health, schedule an appointment at any of our New Jersey practices in Eatontown, Jackson, and Pine Beach.